I have to admit, I love a bit of leopard print. It’s a bit of a guilty pleasure, I guess. I had a pair of gorgeous leopard print platform sandals from Dune which I used to wear to death, everytime I wore them I got compliments. Leopard print always feels like a guilty pleasure but the admiring glances always justify my leopard print lust. A couple of years ago while contemplating buying leopard print leggings on Twitter, Hilary Alexander replied saying they’re a classic and she has three pairs! 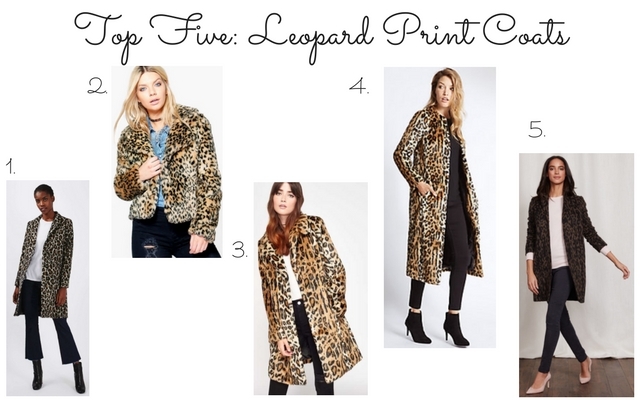 Topshop leopard print coat – £85I really like Topshop’s take on a leopard print coat. The boyfriend fit and slightly muted colour palette make it a subtle, classic wardrobe addition. Boohoo Bella crop leopard faux fur jacket – £30I actually really like the Boohoo cropped jacket. I think cropped fur jackets look cute and the actual leopard print of this little number manages to avoid looking tacky. Miss Selfridge leopard faux fur coat – £89 This coat has a bit of a 60s vibe, with a slightly nipped in waist which flares out. I really like the large leopard print and the dominant brown and camel shades.